It was the nature of partisan resistance that operations against it must either eliminate it altogether or leave it potentially stronger than before. This had been shown by the sequel to each of the previous five offensives from which, one after another, the partisan brigades and divisions had emerged stronger in experience and armament than they had been before, with the backing of a population which had come to see no alternative to resistance but death, imprisonment, or starvation. There could be no half-measures; the Germans left nothing behind them but a trail of ruin. What in other circumstances might possibly have remained the purely ideological war that reactionaries abroad said it was (and German propaganda did their utmost to support them) became a war for national preservation. So clear was this that no room was left for provincialism; Serbs and Croats and Slovenes, Macedonians, Bosnians, Christian and Moslem, Orthodox and Catholic, sank their differences in the sheer desperation of striving to remain alive. From 15 May – 15 June, the 7th SS, Prince Eugen Mountain division (said to have “developed a distinctive reputation for cruelty”) took part in Case Black aiming to pin Tito's main force of about 20,000 Partisans against the Zelengora mountain, in southeastern Bosnia. The 7th SS was raised from the so-called volksdeutsche volunteers of the region, and augmented by Balkan draftees of only partial German background. During the battle, the division was ordered to move through the Italian zone and block the possible advance of Partisans towards the Adriatic sea and Albania, and close the south-east part of the encirclement and then advance north over mountainous terrain to crush the Partisan forces. On May 20 the division captured Šavnik. The Partisans headed by the 1st Proletarian Division broke out of the encirclement, and two battalions of the 7th SS were moved to cover the left bank of the Sutjeska river and block the Partisan's escape route. In Case Black, the division suffered total losses of 613 men. The German claims for Partisan casualties are hard to translate into pure battle casualties, since they often counted the innocent civilians they slaughtered as “Partisans”. Our action depicts a small piece of this overall action between Tito’s now seasoned Partisans and their hunters. You are part of a blocking force to cut off the partisans on the run. You have a forward platoon in the village that sits across the escape route in radio contact with the company HQ off board. The forward platoon has just cleared the village in their normal brutal manner and now occupy it. You will have two more platoons of infantry and a strong armour platoon coming up if the occupying platoon gets in any trouble. Once you are all assembled in the village, you will press on further down the road to chase partisan units that already passed this point before you blocked it. You will have occasional “eyes on” via a Storch recon plane. Reinforcements will arrive primarily via the north road with one infantry platoon via west edge. The armour element is strong: a platoon of three Italian M13/41 tanks and one heavy French Char-B with a flamethrower in lieu of its 75mm hull gun. You are being pressed and are trying to evacuate in order, but a single platoon of fascists and their collaborators have occupied and are burning a village on our route. Your unit already crossed this point and will backtrack to clear the village for those behind, including our wounded, who will enter from the west road and pass through the village and exit via the south road. You should have the element of surprise, as they will be distracted while they are rounding up the villagers for extermination. Clear the village of the enemy before any of his reinforcements come up, make time for our wounded to pass through and get further down the road, and then hold up the fascists as long as you can before continuing our retreat. The enemy is bound to have some armour in the area and we only have a few antitank rifles and a couple captured guns, but the terrain is narrow and rough, which will help. All Partisans start on the board: four infantry platoons, two MMG teams, a captured Italian mountain howitzer, and a captured German PaK 36 37mm AT gun. The hospital train will enter from the west soon after they hear the attack start. The Germans set up their three squads in and around the village square. One squad, with the lieutenant, conducted the work of herding the villagers into the building on the west side of the square and setting it alight, while the other two acted as security. While they went about this horrid business, the Partisan commander watched through binoculars, his blood boiling. From the bluff on the far south edge, he sighted in his two medium machine gun teams, and waited for his four infantry platoons to creep up to the distracted invaders. The Partisans were allowed to set up on Blinds no closer than 12 inches from the security squads. This allowed them to push three platoons fairly close to the back of the building on the east side of the square. At their commander’s signal, the machine guns and a platoon across the marshy wastes on the south end of the village shot up the security squad at the south side of the square to nothingness and the hit the lieutenant’s squad hard enough to persuade them to flee to the north side of the square. The security squad in the east building was swamped by two full platoons at their rear in close combat, with no quarter given. The signalman in the square crouched next to the truck and sent out word to the captain: help! He was soon unable to carry on any further communication. Orders were dispatched to converge on the village. Grasping that they would also be surrounded and destroyed, the remaining five members of the death squad and their leader scrambled out of the village and down the hill, sheltering in the house there. The Partisans gave up the chase and consolidated their position on the crest, and loading their captured truck with their newly acquired guns, ammo, and boots. Soon, the German observation plane flew over and confirmed the fragmentary message already received—the village had fallen. The Partisan hospital train was spotted passing through the village and heading south, along with the captured truck. A few turns passed, allowing the wounded to make it through the village and part way down the road, while two platoons of Partisans stuck to the buildings on the edge of the village and carried on a desultory shootout with the death squad at the base of the bluff. One more Partisan platoon still on Blinds edged out toward the north east corner. Soon after, the German HQ platoon and the other two infantry platoons came onboard, sheltering behind the wooded hills on the north edge of the battle area, awaiting their armour to clear the Partisans. The Germans were relieved when they finally saw their armour come on at the north road entrance. “What is THAT?” wondered the Partisans as the big French Char-B lumbered toward them, surrounded by her three Italian M13/41 handmaidens. They found out as the armour veered left toward the exposed platoon on the east and the Char-B shot a 12” stream of flame into one squad and their lieutenant. They got away with only two dead" amazing luck after the 5D6 fire effect. The Partisan platoons on the village bluff took a quick lesson and before the tank platoon could turn back toward them and advance, they scurried away at top speed from the crest! Discretion is the Better Part of Valour! The door was open, and the German infantry started pressing forward and the tanks clattered up the hill into the village square before the infantry could catch up. In the square, the tanks caught some of the escaping Partisans, but most escaped down the hill and into the woods and marsh beyond, just as the 37mm AT gun and the Italian mountain gun opened up, along with a few antitank rifles. One Italian tank was immobilized by an AT Rifle team. 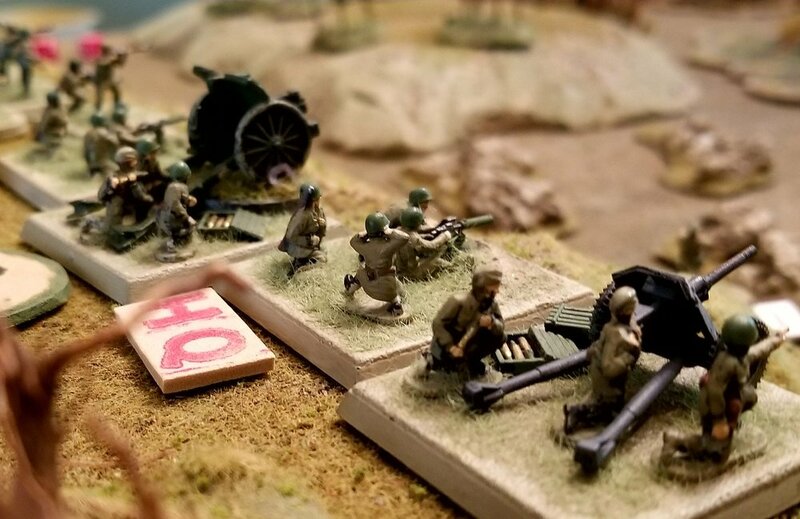 While their fellows were fleeing, Partisan Platoon 3 boldly counter attacked around the west side of the village buildings, grappling in close combat with the German infantry coming up to support the tankers. The assaulting platoon and the defenders were both bled to a small number, effectively eliminating all supporting German infantry. An untouched German platoon, along with a squad from the HQ company had lagged behind and now were still at the bottom of the hill and of no help for the tank assault. We called the game at that point, since the hospital train and captured truck had rounded the bend and were safely away and the Germans could not pursue without heavy infantry support through the marshy wastes and rocky trail beyond. Had we carried on a few more turns, the puny antitank weapons of the Partisans might have done more damage to the Axis armour, and some more of the Partisan infantry would likely have been roasted by the fearsome flammenwerfer, but the result would have been the same: the Partisans would escape to fight another day. Great job Hauptmann Bernie and Lt. Rick, and great job Comrade Captain Lee, and Lieutenants John C. , John M., and newbie Sgt. Chris!